When I moved my husband and me to Seguin 5 years ago, the last thing on my mind was the quality of the public schools. We are retired, my husband disabled, and we were trying to find a good retirement community. Then 4 years ago our granddaughter, Ella, came to live with us. She had experienced so much tragedy and emotional trauma that I needed to find her a "safe" atmosphere in which to learn and grow. The public schools were not ranked very high and I didn't want to throw her into a fish pond. 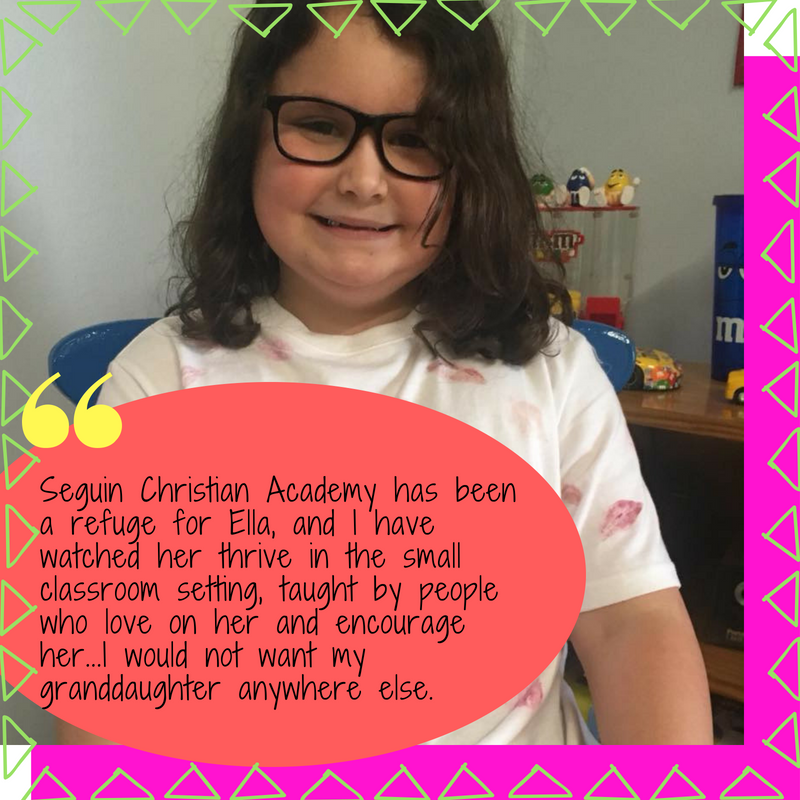 ​Seguin Christian Academy has been a refuge for Ella and I have watched her thrive in the small classroom setting, taught by people who love on her and encourage her. 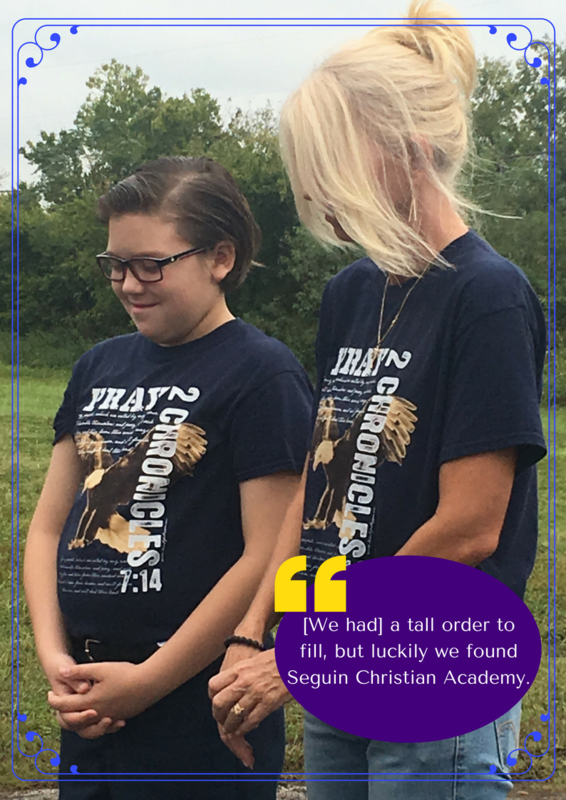 The teachers and volunteers at Seguin Christian Academy are not just living out a vocation, they are answering a call to be salt and light to these children. It's hard to put a finger on it or reduce it down to a formula or equation - this profound effect the school has had on our grandchild and us. We are grateful each day for this gift. I would not want my granddaughter anywhere else. 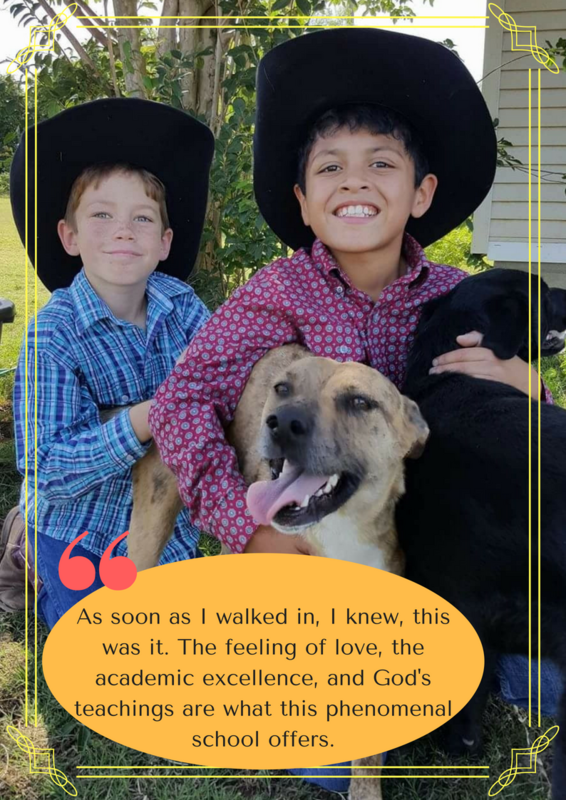 When I helped start Seguin Christian Academy in 2012, I was following God's tug on my heart to help provide the type of school that had been an answer to prayers when our sons had been in elementary school. Little did I know that just 3 years later, our family would increase by 5 overnight, and I am so grateful SCA was here to meet our new needs. It is such a blessing to have my children in a school that feels like an extension of our family. Every time I drive up and see the children running around in the country air, or I walk in and see children of various ages collaborating on a project, I fall in love with SCA all over again. You won't find this combination anywhere else! ​Our daughter Lea has attended Seguin Christian Academy for the past six years. 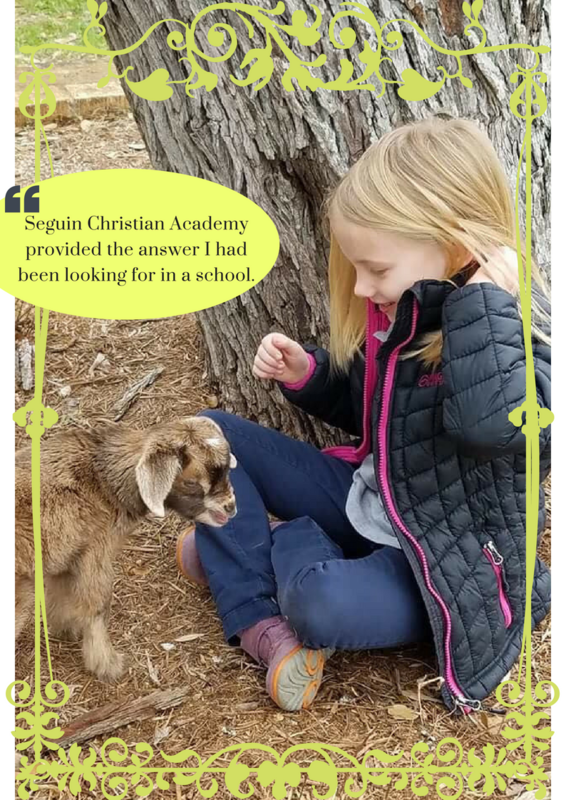 We thought a lot about where to send Lea for Kindergarten and decided on SCA because of small classes and more one on one instruction and a faith based school was important to us. She has thrived being at SCA, She has come out of her shell , She is generous, helpful and thoughtful, and I believe her school environment has had a lot to do with it . The Principal, teachers, volunteers and parents at SCA are truly dedicated to the school and the students, and continue to make sacrifices so the students do not do without. Lea has made awesome friends at SCA over the years, and I believe they will be life long friends. 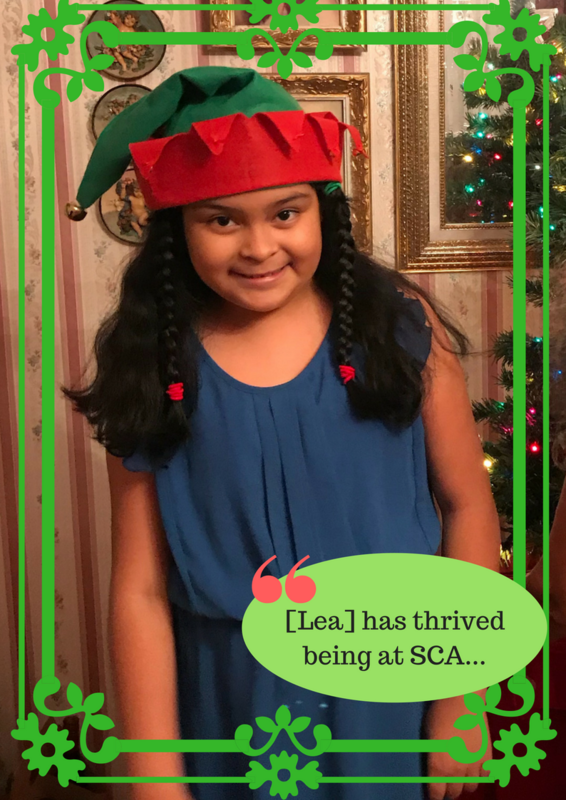 Our daughter Lea loves SCA, and so do we!! Seguin Christian Academy provided the answer I had been looking for in a school. The ability to have more direct/customized learning and an environment that was built with values. I agonized over where to send my daughter before I learned about SCA as an option. I applied to send her to a school district outside of our designated school zone, knowing that the daily drive would take me an additional hour to complete each morning. Meanwhile, I continued looking for alternatives and out of the blue someone handed me a brochure that provided my answer!! I think SCA has been a wonderful growing experience for my daughter. Allowing her to interact with others, while reinforcing the values we want her to embrace. The onsite library has helped encourage her love of learning and books. The lack of playground equipment, which I originally thought was a drawback, has turned into an experience she has grown from. It stretches her imagination and has taught her that "things" aren't required to have fun. When my husband and I moved to Seguin many years ago, we simply did not consider the local schools. After all, we had no children and no children were in our life plan. Surprise!!! Once our surprise was ready for school last year, we did not even consider the local school district for numerous reasons. We were fortunate to have friends steer us to SCA. Our son is immersed in a nurturing, Christian environment and it shows! He is all boy, to be sure, but he is learning skills and a worldview that will benefit him throughout his life - faith, kindness, honesty, compassion, gratitude, perseverance, respect. And he is in a very supporting academic setting with small class sizes and individual attention - much needed for our kiddo! Last but not least, his school recognizes the kinetic nature of kids, especially those boys. They give them ample time to go outside to burn off energy, learn about teamwork, and explore their natural surroundings. 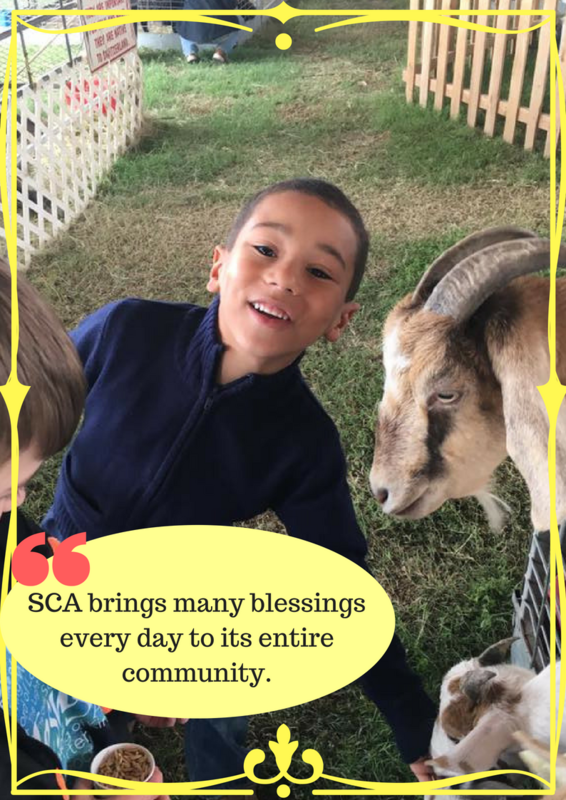 SCA brings many blessings every day to its entire community. Come join us! 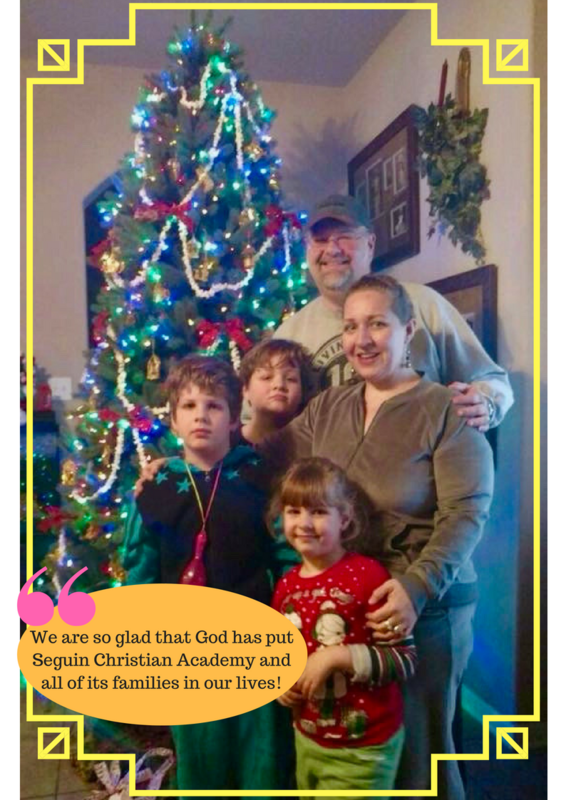 ​Finding Seguin Christian Academy was an answer to prayer for my family. Our kids had a hard time moving from the city to the country, where they didn’t have a neighborhood full of friends to play with every day. They felt lonely and isolated. The quality of the students at SCA is top notch. My kids love the friends that they’ve made at school. They are kind and encouraging; they are the lifelong kind of friends! No worries about bullies or bad influences, and it is so wonderful to see my kids smiling and happy when they talk about their school. 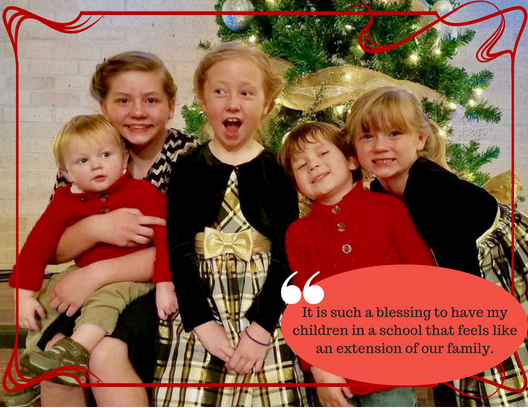 We are so glad that God has put Seguin Christian Academy and all of its families in our lives! ​A couple of years ago we were faced with a dilemma, where to send our son to school, where he would get a sound base for his education while learning Christian fundamentals and be small enough for him to get the “one on one” time lacking in the public schools. A tall order to fill, but luckily we found the Seguin Christian Academy. All of these attributes and more are to be had at this small school. Our son has done very well in this setting and even found BFF’s. I've struggled for days on what to say about one of the greatest Blessings in my life. I have two very precious miracles in my life. These boys God gave me are vivacious, gregarious and ALL BOY!!! I've taught in public schools for 15 years and I knew my miracles would never thrive in that environment. I prayed and prayed and prayed asking God to help me know where to take my sons to be taught. A dear friend, Jessica Ramirez, told me about Seguin Christian Academy. I took my oldest there to "interview" the principal. As soon as I walked in, I knew, this was it. The feeling of love, the academic excellence, and God's teachings are what this phenomenal school offers. It's more than a school; it's Family.